(VIDEO) Since 2010, the project has improved 44 rooms across campus. 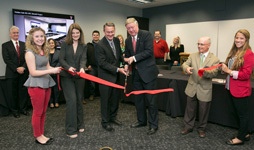 Texas Tech University is working to ensure all students and faculty have access to updated facilities and technology, thanks to its General Purpose Classrooms project. 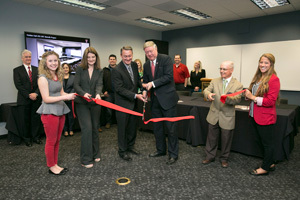 The General Purpose Classroom (GPC) project is designed to serve the entire Texas Tech community by updating classrooms with a wide range of equipment and resources. The initiative began in 2010 and has grown due to its popularity and continued positive feedback from faculty, students and staff. There are a total of 44 GPCs in six buildings spanning the Texas Tech campus: Agricultural Sciences, Holden Hall, Human Sciences, Mathematics, Media & Communication and Science. According to the project's website, a space analysis was completed for all classrooms and meeting rooms on campus. The analysis included condition, usage, location and use by the home department. Upon review, rooms were chosen that were in poor condition and could potentially be used by multiple departments on campus. GPCs are centrally scheduled, which means they can be used for a variety of disciplines. This improves use and provides an appropriate academic space for all course-related activities, Vitela said. Special attention also is paid to ensure the rooms are up to current building codes and in compliance with ADA guidelines. Classroom Technology Services ensures all GPCs have the most current technology. Standards include a Dell computer with BluRay player, projector with motorized screen, Polycom phone, Intellimonitors, interactive display, ceiling speakers, podium and wireless microphones for sound reinforcement & ADA assisted listening, wireless keyboard/mouse, and both HDMI and VGA laptop connections. Some rooms also are equipped with more specialized equipment based on instructional demand. Examples of this include document cameras, additional flat-screen television displays and interactive video conferencing equipment. Instructors overwhelmed by the technology need not fear, Chambers said. The furniture in each room is chosen based on functionality, size of the room and pedagogical need. Neutral color schemes are selected, and rooms are carpeted to help dampen sound interference. Large dry erase boards are installed to provide ample space for students and instructors to write. Each room is carefully checked each week for any maintenance needs. This helps maintain the quality of not only the physical room, but the technology as well. Anyone interested in having a room become a General Purpose Classroom can submit information about the room and the department managing it to Academic Support and Facilities Resources for analysis at patricia.vitela@ttu.edu or asfr.facilities@ttu.edu. For construction updates and more on the project, follow the GPC Blog. Holden Hall: 028, 033, 038, 104, 106, 109, 111, 127, 128, 130, 152, 154, 155, 225, 255. 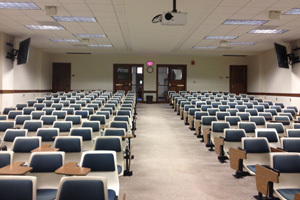 Human Sciences: 169 (technology only; room has not been renovated), 273. Media & Communication: 053, 055, 057, 067, 075, 080, 082, 083, 084, 153, 155, 157, 166, 168, 253, 255, 257, 266, 268, 270, 281, 353, 359.